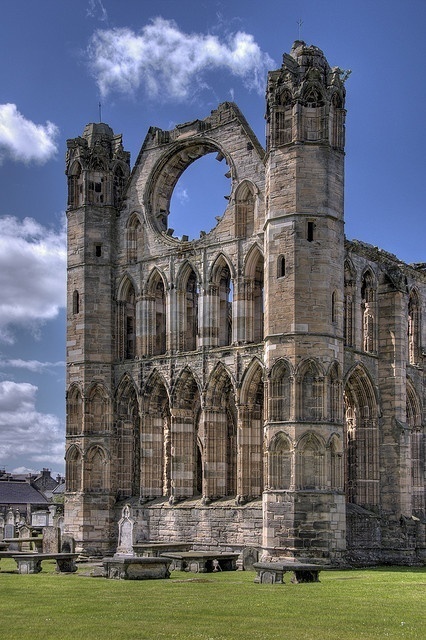 Elgin Cathedral, dedicated to the Holy Trinity, sometimes referred to as The Lantern of the North is a historic ruin in Elgin, Moray, north-east Scotland. It was established in 1224 on an area of ground granted by Alexander II that was close to the River Lossie and outside of the burgh of Elgin. Before its transfer to its present position the cathedral was located at Spynie, 3 km to the north, and was served by a chapter of eight clerics. The new cathedral, much larger than before, was staffed accordingly with the number of canons increased to 18 in 1226 and then again to 23 by 1242. A fire in 1270 damaged the cathedral significantly initiating a major rebuilding programme that substantially increased the size of the edifice. It was unaffected by the Wars of Independence but was again badly damaged by burning in 1390 following an attack by Robert III's brother Alexander Stewart, Earl of Buchan, also known as the Wolf of Badenoch. In 1402 the cathedral precinct again suffered an incendiary attack by the followers of the Lord of the Isles. The number of clerics required to staff the cathedral grew steadily as did the quantity of craftsmen needed to maintain the buildings and surrounds. The number of canons had increased to 25 by the time of the Reformation in 1560 when the cathedral was abandoned and the services transferred to Elgin's parish church of St Giles. After the removal of the lead from the roof in 1567, the cathedral fell steadily into decay which was only arrested in the 19th century when it was in a substantially ruinous condition.